ISLAMABAD, Pakistan — A team of journalists working for The Daily Mail newspaper investigating the drug trade in Afghanistan have made a startling disclosure that Mr. Izzatullah Wasifi, a brother of Afghan President Hamid Karzai, was arrested by the U.S. authorities from Caesars Palace, California, along with his wife Fereshteh Behbahani on July 15, 1987, for the trafficking of high quality heroin. Wasifi was sentenced for three years and eight months while his wife was sentenced to three years probation. 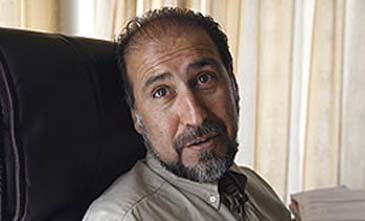 However after the formation of Karzai government in Kabul, Izzatullah Wasifi was made the Governor of Farah province of Afghanistan and later, last year, his brother, Hamid Karzai, appointed him as the all powerful Chief of Afghanistan's General Independent Administration of Anti-Corruption with responsibilities to prevent the Opium growth and Heroin production and its illicit export. Keeping in view Mr. Wasifi's past, it is nothing less than stunning to notice that the person who a few years ago was a drug trafficker is today Afghanistan's chief anti-drug trafficking officer. Wasifi used to be an anchor between the Afghan drug barons and the Western drug buyers and used to run a drug trafficking operations. The Daily Mail's findings reveal that after being made Governor of Farah province in 2001, he established close links with at least four governors of Karzai government and formed a new, huge and comprehensive drug network. Getting investments from foreign allies, Wasifi established a massive chain of the heroin laboratories across Afghanistan. He later came up with the proposal of forming of an all powerful General Independent Administration for anti-corruption with responsibilities to check heroin production and trafficking and his brother, the Afghan President, wasted no time to appoint him the chief of the said department. According to underworld informants, Wasifi today is considered to be the world's biggest heroin producer and trafficker with an estimated annual income of around a trillion U.S. dollars. According to some reports, his ex-wife Fereshteh Bebahani, who was convicted with him for drug trafficking in 1987 and now lives in Los Angles, California, is also one of his associates and books orders for the supply of heroin to the U.S. and Latin America. In a bid to capitalize on the political chaos and war-lord culture prevailing in Afghanistan, India for the first time opened four new consulates in Mazar-i-Sharif, Herat, Jalalabad and Kandahar, in addition to reopening an oversized embassy in Kabul, closed after the departure of Soviet backed regime in Afghanistan. This makes Indian diplomatic representation the largest in Afghanistan, bigger even than that of the U.S. India does not have any big legitimate commercial interests tied to these Afghan cities, neither does it have any expatriate Indian community nor frequent travelers to or from India and Afghanistan seeking visas of passport assistance. Taking into account the current socio-economic and security conditions in Afghanistan, there seems to be no commercial or consular justification for India to have opened a consulate, for example, in the small-remote Iranian town to Zahidan on the border of Balochistan province of Pakistan. These Indian consulates are actually working to strengthen bonds with the Afghan warlords and drug barons who are one and the same owing to the entrenchment of drug culture in the Afghan political structure. The Pakistani government has gathered sufficient evidence linking recent incidents of sectarian terrorism in Pakistan with the Afghan warlords sympathetic to the Northern Alliance. While training to the sectarian terrorism is being provided by Indian intelligence agency RAW's personnel stationed in the Indian consulates in Afghanistan, financing for terrorism against Pakistan is invariably being done through drug money. Disclosure of the former Interior Minister Makhdoom Faisal Saleh Hayat about the existence of six Indian terrorism training camps in Afghanistan is a clear pointer in this direction. The maiden horrific attacks by this narco-terrorist nexus was carried out in July 2003 on a Shiite Mosque in Quetta, Balochistan, killing 53 worshippers which was followed by a number of such attacks and it is believed that the last week's attack on the Indian Embassy in Kabul was also the result of some ex-players of the Wasifi racket who were expelled from the racket on suggestions of some new players from India. It is of great concern that the members of the Northern Alliance, who are known for their direct links to the production of opiates, constitute a considerable portion of the government at all levels. Ironically, Northern Alliance members in the Interior Ministry are now responsible for counter-narcotics operations. Furthermore, high-level officials in Kandahar, Helmand, and the Defense Ministry are also reportedly tied to the drug trade. This situation is further exacerbated by numerous recent allegations that soldiers from the interim government's security forces have been guarding drug markets. "The U.S. must understand the strong relationship between drug production and terrorism and should, therefore, recognize the need for strict action against drug production in Afghanistan. The U.S. administration must redefine its priorities in Afghanistan and realize that the elimination of drug economy is an issue of peace and stability and a sine qua non for its success in the war-on-terror," expressed Adrew Moses, a renowned U.S. analyst, when contacted by The Daily Mail. The Daily Mail's investigations further indicate that the U.S.-led International Security Assistance Force in Afghanistan (ISAF) and the NATO forces have declined to pursue the eradication of opium poppy crops under the pretext that the activity was beyond their mandate. Clearly, the U.S. is avoiding a potential conflict with the Afghan warlords, the major beneficiaries of drug, whose political support is essential for the sustenance of Karzai government. However, in doing so the U.S. is ignoring the strong nexus between the drug economy and the continuing instability in Afghanistan and the growing terrorist activities in the region. The Afghan warlords have been netting huge profits from the drug trade emanating from poppy production in areas under their control. It is not difficult to see that the Afghan warlords have vested interest in ensuring that the State remains week in Afghanistan so that they can continue with their profit-yielding drug trade without the fear of a strong action by the authorities. Consequently, the warlords are channeling a portion of their drug earnings to fuel terrorist activities and attacks against the Karzai government and coalition forces. Thus by giving a free-hand to the warlords and drug barons in return for their political support to the Karzai government, the U.S. is in fact undermining its own objective of peace and security within Afghanistan. In comparison with these dubious allies of Washington in Kabul, Pakistani officials spent the past six years giving the Americans realistic recommendations on how to restore stability to Afghanistan. One of those recommendations was to neutralize the influence of the drug barons in the Karzai government by welcoming back the alienated Pashtun majority of Afghans. Strangely, Washington continues to ignore the recommendations of its Pakistani ally for fear of alienating the corrupt elements in the Karzai government. Even more surprising is how Islamabad continues to shy away from creating some international noise about the serious challenges of Indian-sponsored narco-terrorism from Afghanistan, Pak-Afghan warlords and their involvement in drug trade. Apart from being a victim of terrorist activities financed by Afghan drug money, Pakistan has also suffered the most from the menace of heroin addiction. As such Pakistan has a strong stake in lobbying for a more proactive international strategy to fight the narco terrorism nexus in Afghanistan. According to some unconfirmed reports, Pakistani intelligence agencies, in interrogations with arrested al Qaeda operatives, gleaned information that shows that terrorist cells in Afghanistan heavily relied on Afghan drug money to run their operations. On the other side, Pakistan's anti narcotics authorities have been putting pressure on the Pakistan government and Islamabad's Foreign Office to take up the drug trafficking issue with Kabul. However the Pakistan government is yet to take up this issue with Karzai government in a strong manner since Islamabad is busy in appeasing Kabul in an effort to establish some kind of an extraordinarily cordial relationship between Kabul and Islamabad. Despite the fact that Pakistan and Afghanistan governments have signed a number of accords and agreements for a joint terror combat and eradication of the menace of drug trade with Interior Ministers from both the countries holding frequent meetings, it remains a matter of prime concern for Islamabad that Kabul has not moved even an inch to counter the drug business in Afghanistan.